The Blue Fish is like no other restaurant and bar. By the unique design of the restaurant, it created an atmosphere that will provide guests with an unparalleled dining experience. The bar and dining room converge with the exquisite tastes of the freshest sushi prepared by the most talented sushi chefs in the Southwest. 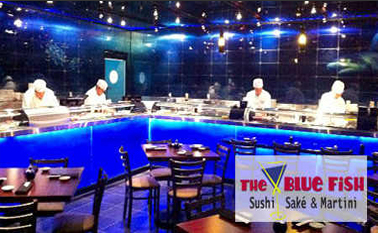 If you are looking for a sushi place that demonstrates a bit of creativity while keeping the focus on the fish, try The Blue Fish! The opposite of a quiet, intimate sushi bar, The Blue Fish is enormous, loud, stylish and good.